HISTORY: COLONIAL AIRLINES was a United States airline from the 1940s and 1950s with bases at LaGuardia Airport (LGA) in New York City and at Montreal St-Hubert Airport in Montreal, Canada. It was founded as Canadian Colonial Airways on 6 March 1928 to operate Foreign Air Mail Route from New York to Montreal via Albany, New York. Services began to Canada on 1 October 1928. 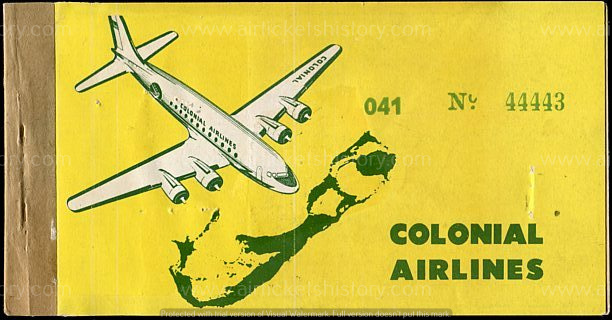 After acquisition by a group of investors, the airline was renamed Colonial Airlines on 1 May 1942. After several reversals of government policy, Eastern Airlines emerged as the acquirer and the operational merger took place on 1 June 1956.